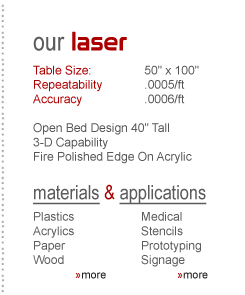 We are your source for precision cutting, etching and engraving using CO2 laser technology. Our 50” x 100” open bed table design gives us the ability to do not only the small, but also the large applications where speed and accuracy are important factors. Laser Synergy, Inc. is owned and operated by Jeff Riewer. LS2 was created to provide advanced computerized laser operations for industrial, commercial and retail applications.